Do you have any end of the year zucchini (or other summer squash) and tomatoes that need used up? Then look no further! This recipe is so amazing, I wish I had known about it to make it all summer long. 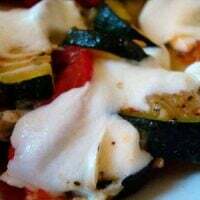 It is a simple combination of sauted zucchini, onions, garlic and seasonings that are combined with fresh garden tomatoes and smothered in cheese. The beauty is that it comes together in about fifteen minutes max. How can you go wrong with that? I made this last night as a side dish and it was easily the best part of the meal. Here’s to hoping I remember it next year when my zucchini and tomatoes are at their peak!! In a large skillet, saute the zucchini, onion, garlic and seasonings in olive oil until crisp-tender (about five minutes). Gently stir in the tomato; sprinkle with cheese. Remove from the heat and let stand until cheese is melted. Serve immediately. Loved this flavorful, saucy zucchini. It’ll be a new summer regular for us with lots of variations. The cheese turned into big chewy globs for me, so I’ll leave it out or try a different one next time. My husband and I loved it. Big girl (4) ate only the tomatoes, and Little boy refused it. Zucchini is a tough sell for my kiddos. I think it’s the texture. More for me! This simple little unassuming dish is amazing! I was just trying to use up some zucchini and squash, so I did a search for “zucchini” on your site, and decided this looked easy. It WAS easy, and so very delicious! Thank you! This is delicious! You need to bring this out of the archives as I just discovered it last week and have already made it twice with it on rotation for tonight’s dinner as well. So easy. So summery. So delicious! I’ve been a reader since the beginning but somehow I missed this one. Shame on me! We make this a lot in the summer, adding more tomatoes to make it a bit more saucy, and 1 lb. pork sausage to make it a main dish using both parmesan and mozzarella. It is truly delicious. We had this as a side dish for dinner last night and we loved it. My husband, who is not a big fan of vegetables, had seconds! I used fresh mozzarella, cubed, because I had some – and it worked fine. Yummy! Thanks!! When will I learn to stop doubting you? Honestly, I have never liked zucchini my whole life. But, I grew it in my garden this year for some unknown reason so now I need to use it. And this was AMAZING. It’s the herbs and the onions and the cheese. Makes the zucchini taste subline. I will absolutely be making this again and again. Thanks for the great idea Mel! Mel – simple, and excellent! I made this tonight, and served it on top of pasta. I used red onions, I added in quartered button mushrooms, and used fresh oregano. Excellent! Even my husband who doesn’t like zucchini liked it. Thank you! Love this- I used Parmesan cheese, still wonderful! You had me at the picture alone! Yum! Hi!I love your blog! Actually, I probably should have said “Hi” earlier but I’ve been shy. Anyway, at the suggestion of one of my readers, I have started my own food/cooking blog. I’ve included a link to your blog in my sidebar. I hope that was okay. If not, please let me know and I’ll remove it asap.Thanks! Looks yummy..I love the addition of the cheese! 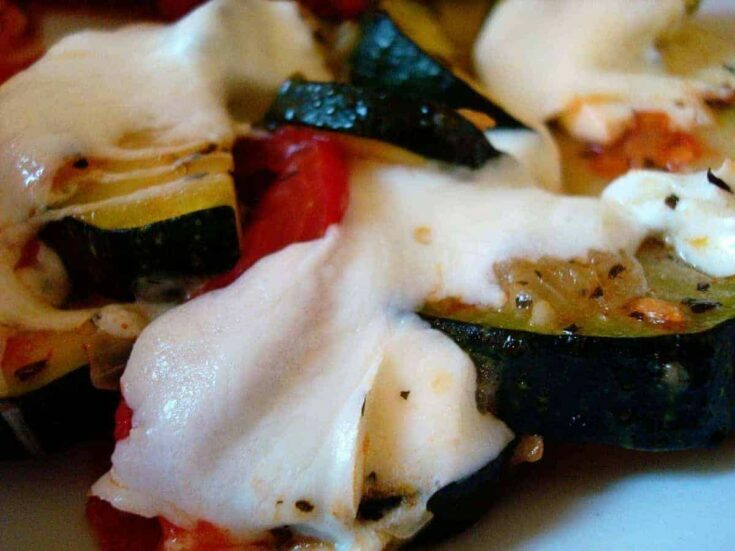 Great recipe…..try provolone cheese instead of mozzarella.